Walking on our heels, a feature that separates great apes, including humans, from other primates, confers advantages in fighting, according to a new University of Utah study published today in Biology Open. Although moving from the balls of the feet is important for quickness, standing with heels planted allows more swinging force, according to study lead author and biologist David Carrier, suggesting that aggression may have played a part in shaping our stance. "This story is one more piece in a broader picture, a suite of distinguishing characters that are consistent with idea that we're specialized at some level for aggressive behavior," Carrier says. Carrier studies biomechanics of how animals move and what the mechanics of movement suggests about the course of an animal's evolution. Such studies in primates and humans addresses a centuries-old controversy about human nature. Is humanity naturally aggressive and confrontational, made less violent through the recent controlling influences of governments, or inherently peaceful and benevolent, turning belligerent only when states and economies led to centralized power and ownership of resources? Carrier says that when members of the same species compete for resources or mates the stakes are high and physical competition is costly, demanding peak performance from the musculoskeletal and cardiovascular system. 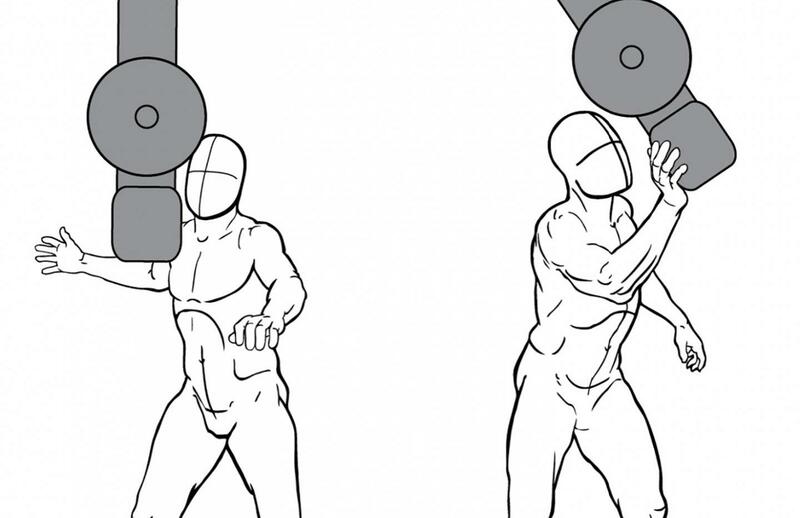 The physiological traits that confer advantages in fighting are different from those required for other tasks. "The folks who line up for the Olympic marathon are not built the way the fighters are," he says. "They're not built the way sprinters are. If aggression was important in our past, we should see evidence of it in our anatomy." If the characteristics that distinguish humans and great apes from other primates are not beneficial for fighting, he says, then the hypothesis that aggression was important in our evolutionary past would be falsified. If, however, apes' distinguishing anatomical traits are beneficial to fighting success, then the hypothesis that physical competition helped shaped our evolution would be supported. Most species of mammals, including most primates, stand, walk and run with their heel elevated above the ground. These stances, called digitigrade and unguligrade, increases the economy of running by lengthening the limb and improving the storage and recovery of elastic strain energy in the tendons and ligaments of the lower limb. The heel-down posture of great apes, called plantigrade, is shared with other species that are less specialized for running, such as bears, wolverines and some rodents. One hypothesis for the evolution of the great apes' stance has to do with how apes climb and forage in trees. Instead of walking on four limbs along the tops of branches like other primates, apes tend to hang using their arms and walk on their hind legs with balancing support from their arms on other branches. To facilitate this, apes may have shifted their center of mass toward the hind legs, which would yield a plantigrade stance. 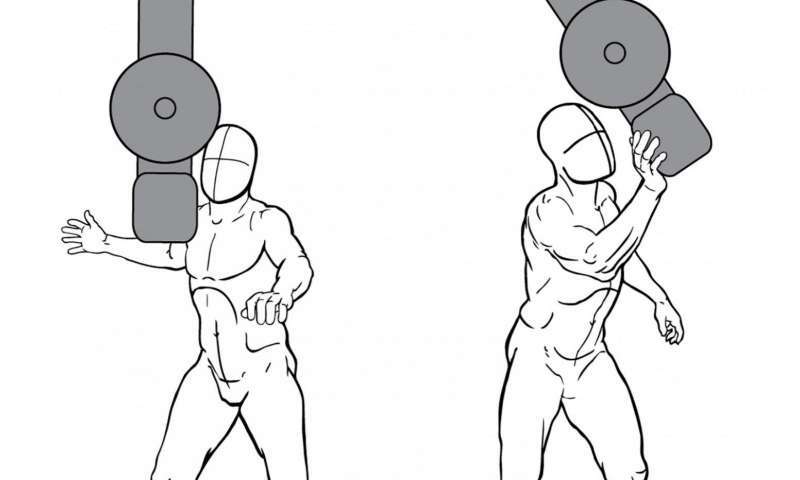 Another hypothesis, which Carrier and colleague Christopher Cunningham of the University of Georgia explored, is that a plantigrade stance allows the arms more striking force by increasing the torque, or rotational force that can be applied to the ground. Carrier and Cunningham set up a force plate for volunteers to stand on that recorded the force applied to the ground while the volunteers struck and pushed a large weighted pendulum. 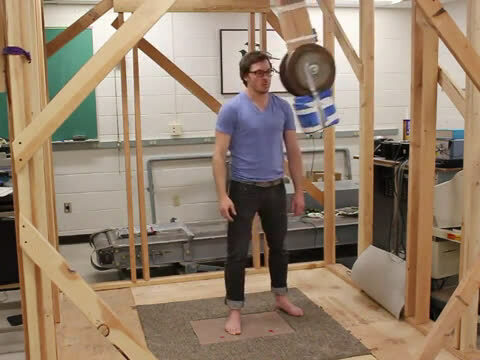 By measuring the velocity that the volunteers imparted to the pendulum, along with the pendulum's known resistance to acceleration, the researchers calculated the work performed. Twelve volunteers completed the task with heels planted and heels up, either with one foot or two. The striking and grappling behaviors studied included lateral strikes and pushes, downward strikes, forward pushes and rearward pulls. To further illustrate the significance of the rotational force applied by the feet, Carrier says, they also asked volunteers to push the pendulum while standing on a sheet of Teflon and wearing a fuzzy sock. With no ability to exert a rotational force on the ground, the volunteers simply spun in place. In all cases, the force or energy applied was greater in plantigrade posture than digitigrade, confirming the team's hypothesis that a plantigrade stance allows a person or ape to exert more force and energy, an advantage in fighting. Physical aggression is clearly not the only behavior that influenced the evolution of our feet, Carrier says, but the results of this experiment are consistent with the hypothesis that selection on fighting performance played an important role. "We're all familiar with the 'fight or flight' response of animals in danger," says Emily Carrington, a program director in the National Science Foundation (NSF)'s Division of Integrative Organismal Systems, which funded the research. "Certain species tend to be good at fighting or fleeing, but not both. This study provides insight into the basis for this trade-off. Animals that are able to use their heels to plant their feet firmly to the ground, like bears, badgers and great apes, are able to deliver stronger blows to their opponents." Regarding the broader question of whether or not selection on aggressive behavior influenced the evolution of our species, Carrier points out that "the shape of our feet is one of a series of distinguishing anatomical traits, from our faces to our heels, that increase fighting performance." Did violence shape our faces? Standing up to fight: Does it explain why we walk upright, why women like tall men?